FTR recently gave the app Poker Notes Live a closer look to see if it would be worth recommending for live poker players. To sum it up in one short sentence, yes we do recommend the app and find it to be useful for live grinders. For the longer version, read our review below! 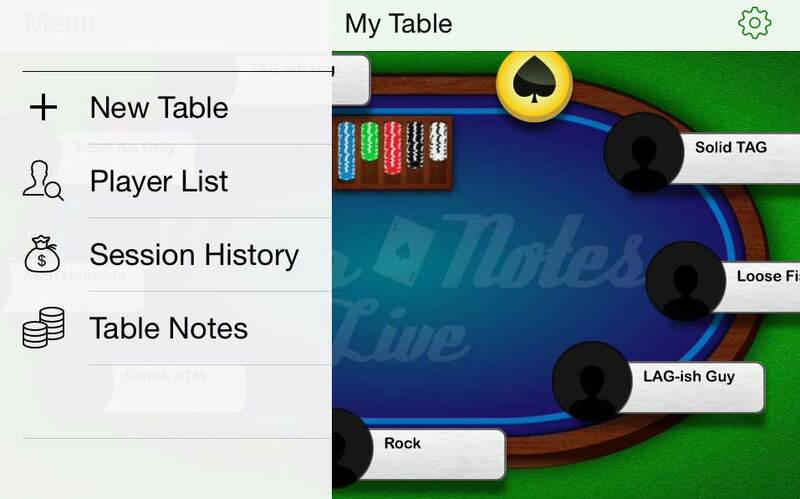 The Poker Notes Live app is created specifically for live poker players who want something to help keep track of the table action. When used properly, it can be a very useful tool for players. The biggest advantages of this app is the way it allows you to keep track of your opponents and take notes on them, not to mention creating profiles and tagging them with color tags like you would in an online game. It is also a great tool to keep track of your sessions and view your long term results. It’s probably safe to say that this app is much more useful for cash game players rather than tournament players. Playing tournaments, you won’t see the same opponents very often. Taking detailed notes on them and profiling their play might be a bit of an overkill, since it will make for a huge player list and it’s unlikely that you will see most of those players at your table again. The app is available in 6 different languages in iOS and 9 on Android. There is no way to toggle the language within the app, instead it’s designed to match your phone’s settings. For example, if your phone is set to Spanish, the app will appear in Spanish. The biggest advantage of the app is its simplicity. Once you launch the app, you can fill the virtual table with players and general notes and info in a matter of minutes. The default selected table is a 9-max table, but other table sizes are available starting at 6-max through 10-max. 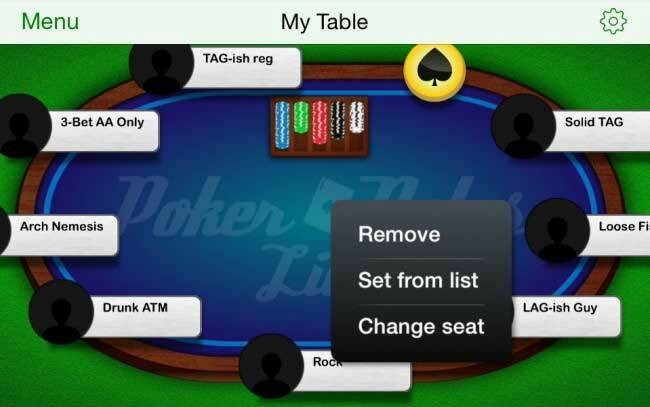 The app is optimized for iPhone 5, so running it on older versions may result in the table not fitting the screen entirely, though this is not a major problem, since the table can be moved to have the needed player in full view. So far, three table themes are available. ‘Green’ is the standard, but you can also choose from ‘Dark’ and ‘Blue’ themes. Players are added to the table with a single tap and first player added always being yourself. By clicking on yourself or any other player, you can input the buy-in amount, cash out amount and any tips or other expenses for the session. To remove a player from the table, tap the player and hold until a menu pops up, then tap ‘Remove’. If you want to add a new player to the table, you can add one from the Player List using the same menu. 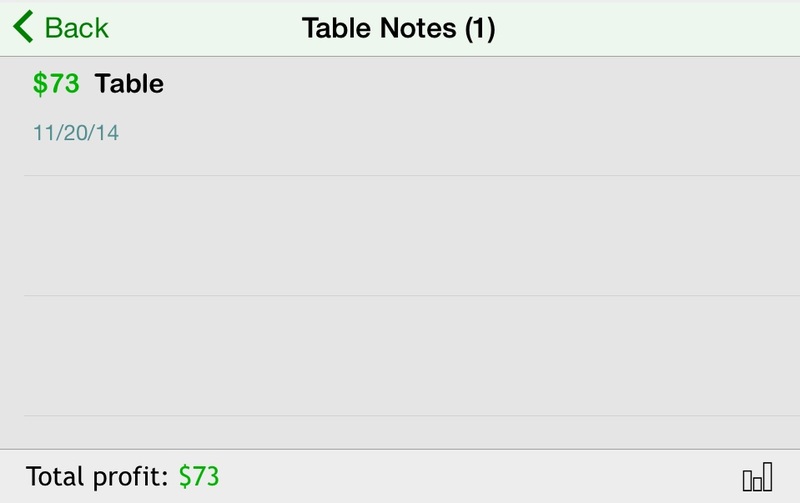 All players are saved to the list, along with their profile and all their notes, as soon as they are removed from the table or you start a new table. The list itself can be accessed through the main menu at the top left corner. To take notes on your opponents, simply tap on a players name. 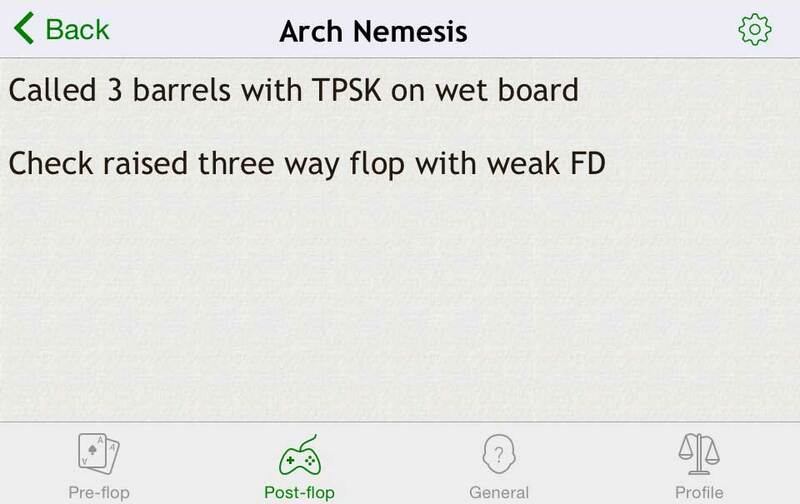 Here you will be able take notes on preflop play, postflop play as well as general tendencies. In a sense, this is a bit of an improvement to the standard notes feature in any online poker room. 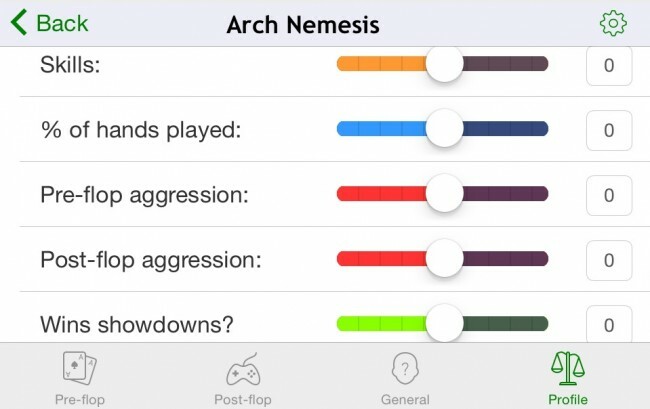 The Profile section allows you to set the players overall skill rating, preflop and postflop aggression factors, the percentage of hands played and win percentage at showdown. While this is a useful thing for any player, the lack of customization in this section is a small downside. By tapping the setting button at the top right corner, you can tag the player using icons or color tags, which will help you quickly recognize his overall style of play in the future. The session management feature can be accessed through the main menu by tapping ‘Session History’, even though for some reason when opened it says ‘Table Notes’. While this isn’t an issue directly related to the app itself, the app will only be as useful as the rules of the card room. Most card rooms I’ve played at allow the use of phones and other devices at the table, but not while you’re involved in a hand. So you wouldn’t be able to pull up your notes of a player while involved in a hand as you can online. However, the act of writing them down should help you remember crucial moments. I have played in some rooms that do not allow the use of phones at the table whatsoever. Using this app would be quite cumbersome in these rooms. 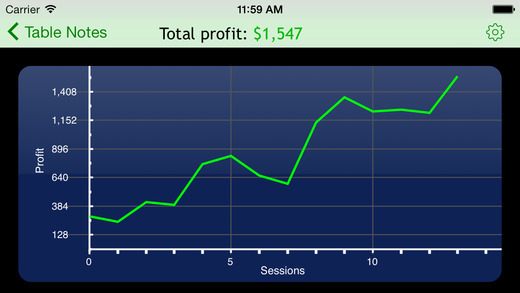 The session history and graph is very useful to keep track of your profit. However, I do wish there was more stats shown here such as an hourly rate, total paid in tips, drinks, etc. It would also be nice to have a distinction between cash games and tournaments. Poker Notes Live offers players a very intuitive interface, which allows for quick note taking and tagging. The session history results and graphs are useful for keeping track of your progress. If you are a regular cash game player, at $4.99, there is no reason not to get this app. Best-case scenario – it will help you increase your win rate in the long run, and even if it is by a small fraction of your current win rate, it still is a sound investment. Worst-case scenario – you lose a couple of big blinds. While we ran into a few small issues, these were minor and didn’t affect the overall performance. The app is also being updated consistently, so we expect more features and fixes in the near future. For more information, check out the Poker Notes Live article from Cardplayer Lifestyle.